A number of years ago, Mary Lisa Kitakis-Spano was an active painter who also created fun whimsical items for sale at craft fairs. It was at one craft fair that Mary Lisa first met Helen Walsh, Nurse Manager of the Bone Marrow Transplant Unit at the University of Florida’s Shands Hospital. Walsh told Mary Lisa about a new program they had planned for the patients on the Bone Marrow Transplant Unit and asked Mary Lisa to come be a part of the program. Mary Lisa at first didn’t think she had anything to contribute and turned down the suggestion. Several craft fairs later after Walsh had become one of her best customers, Mary Lisa decided to find out what the program was all about. It was the introduction to a seven-year old patient in bunny slippers who stole Mary Lisa’s heart and changed the course of her life and her art. After that first experience, Mary Lisa watched other artists interacting with patients. 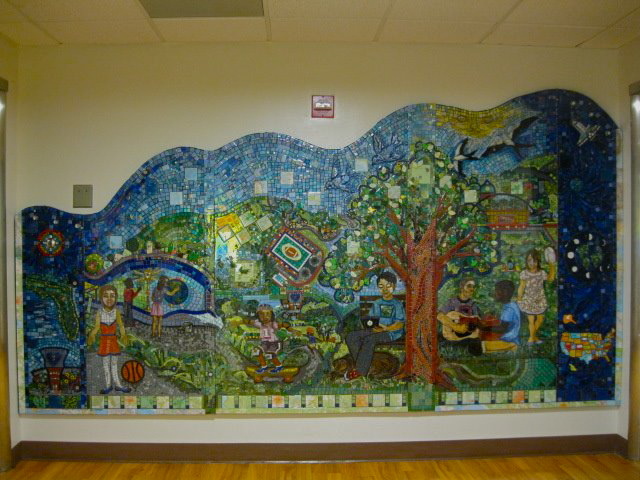 The University of Florida, Shands Hospital Art in Medicine (AIM) program was at the time working with artist, Lee Ann Dobson to put together a large mosaic piece for the hospital lobby from ceramic tiles painted by the patients. 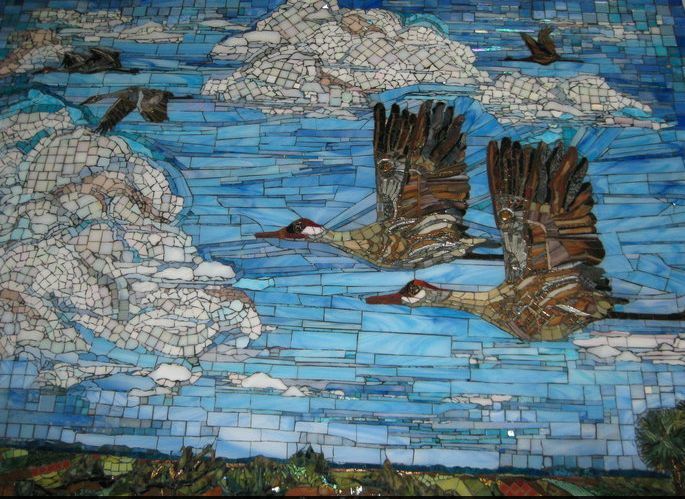 Mary Lisa collaborated with Nancy Lassater and began creating mosaic pieces for the patients in other parts of the hospital. The work with mosaics led Mary Lisa to become a mosaic artist herself. She has since created a number of beautiful pieces currently on permanent display at the hospital. 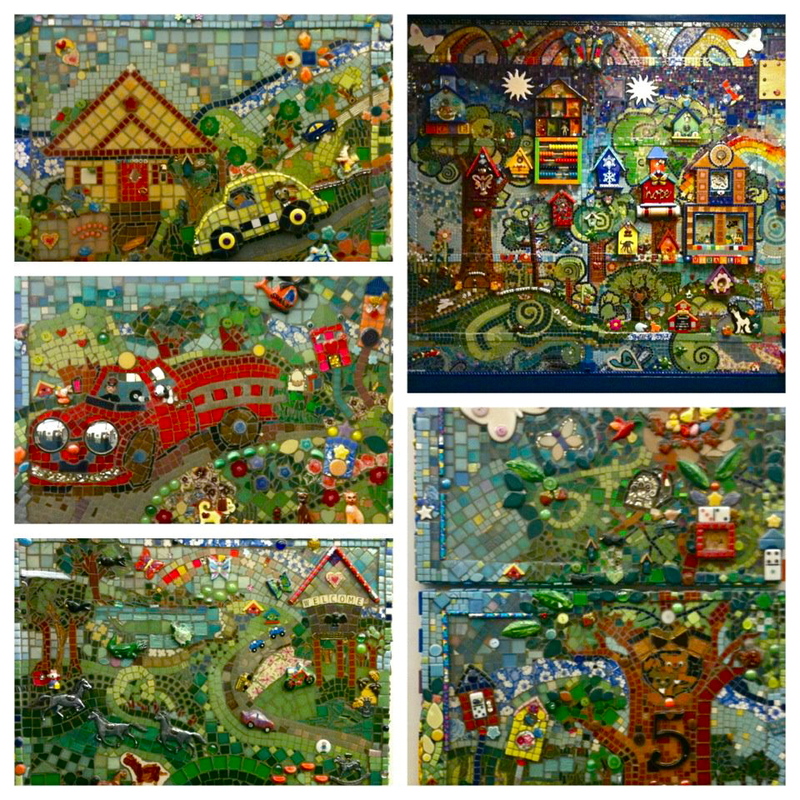 One of her mosaics for the children’s unit is an elaborate colorful creation of whimsical birdhouses. For her most recent work, Mary Lisa spent time talking with the young patients and their families, hearing their stories. She soon discovered all the patients wanted to be outside. She asked them where their favorite places outside were. One child liked the University of Florida’s Bat House (a popular attraction), others liked horses, some liked skateboards. Mary Lisa took all these family stories and incorporated them into the mosaic, including the Bat House. Some of the children placed a few of the actual pieces into the mosaic. Mary Lisa says this mosaic became about being outside. Twenty years ago, Mary Lisa Kitakis-Spano joined UF’s AIM program and began working with the young patients of the Bone Marrow Transplant Unit and the pediatric units. She shares her experiences every summer with aspiring artists in healthcare at the AIM program’s Summer Intensive. Mary Lisa says, “We rarely have the opportunity to truly make a difference with our art. Sometimes it can be something as simple as drawing a picture of a child’s pet.” That simple picture can make a huge difference to one small child facing a life altering hospital experience. Mary Lisa’s chance encounter with Helen Walsh led to meeting the “beautiful little girl in the bunny slippers,” and on to many more patients and many more stories. Each and every patient and experience became an opportunity for Mary Lisa, through her art, to touch the lives of others in a deeply meaningful way. 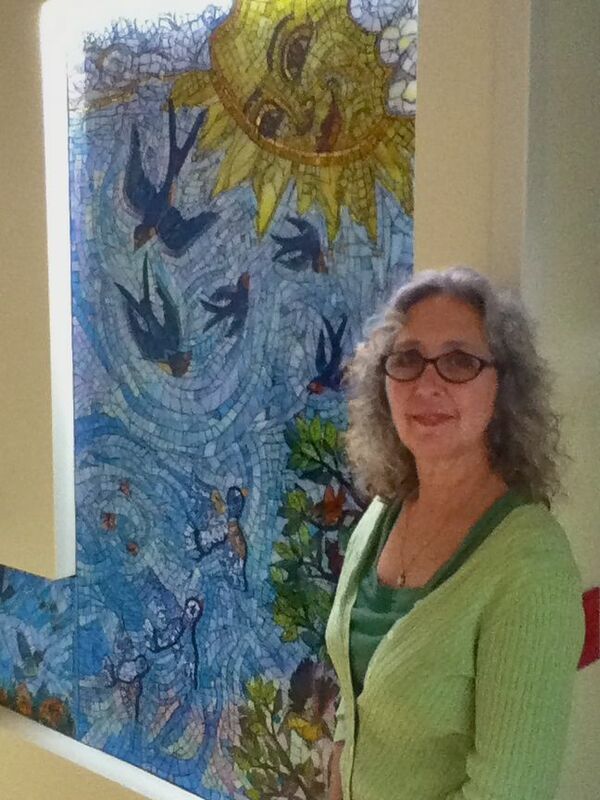 Today Mary Lisa continues making art with and for patients and their families, and creating the exquisitely beautiful mosaics that have become her sustaining art. This entry was posted in art, art in healthcare, artists inspiration, Uncategorized and tagged Art, art in healthcare, Mary Lisa Kitakis-Spano. Bookmark the permalink. Fantastic story – there are such wonderful people in the world. Yes!! And she is definitely one of them !